Without a doubt, the most popular homegrown vegetable in America is the good, old-fashioned ripe, juicy tomato. Now I realize that a tomato is technically a fruit, but I think we all agree that it is a truly tasty vegetable. Jane and I are by no means experts at growing tomatoes. But we have experienced what I consider great success in the past few years. So for what it’s worth, we’re going to share with you how we grow our own tomatoes. 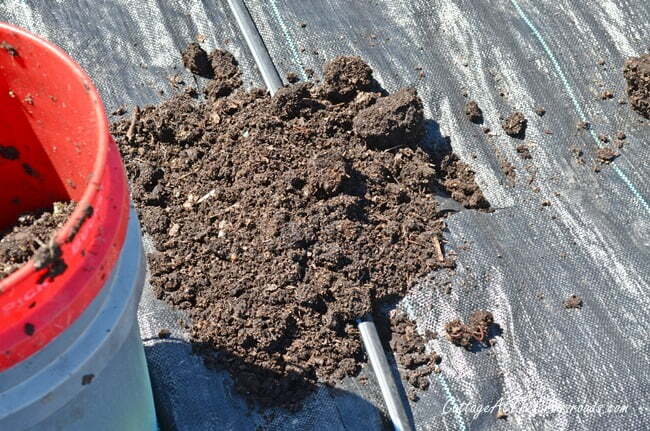 Long before spring planting time, I began preparing our soil for the garden . You can read about that process in our post 5 Tips for First Time Vegetable Gardeners. 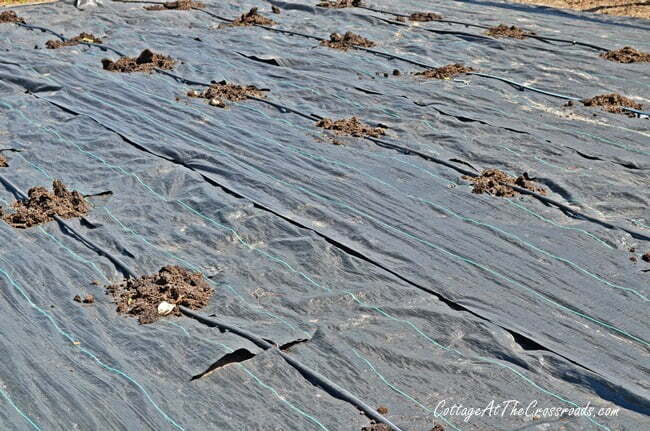 One of the best things that we did last year, and I will do from now on, is laying out weed prevention landscape fabric. Because we grow so many tomato plants, the expense of the fabric is worth it. If you just have a few plants, you may choose to hand pull the weeds. But remember, weed control is important. 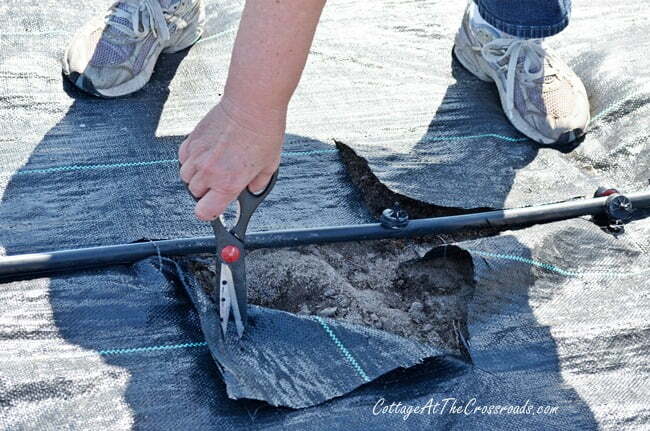 After the landscaping fabric is in place, we place our drip-line irrigation hoses on top of the fabric. Last year the hoses were hard to get to under the fabric, so this year I chose to put the hoses on top because I have to constantly monitor and tweak the irrigation system. One of the keys to growing healthy tomatoes is consistent watering. We’ve been purchasing our drip-line irrigation supplies over the past few years from a local irrigation supply company, but they are available at big box stores such as Lowe’s. Next Jane cut a hole in the fabric at each dripper. I dig a hole at each opening and put one shovelful of a commercially available compost (Black Kow) and a shovelful of our own compost. 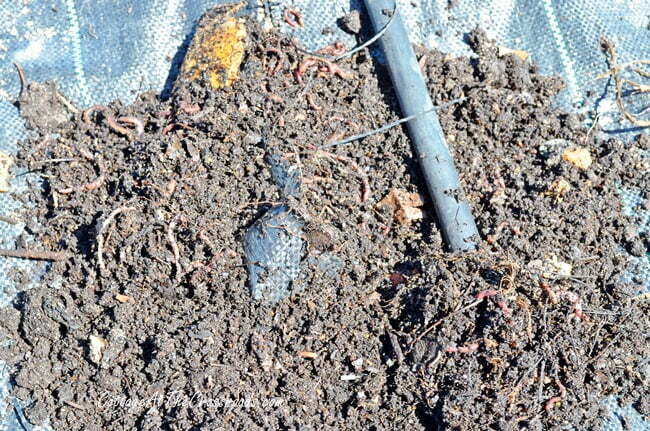 Our compost comes loaded with earthworms-nature’s natural cultivators and crushed eggshells. To top it off, we put a small fish in every hole. 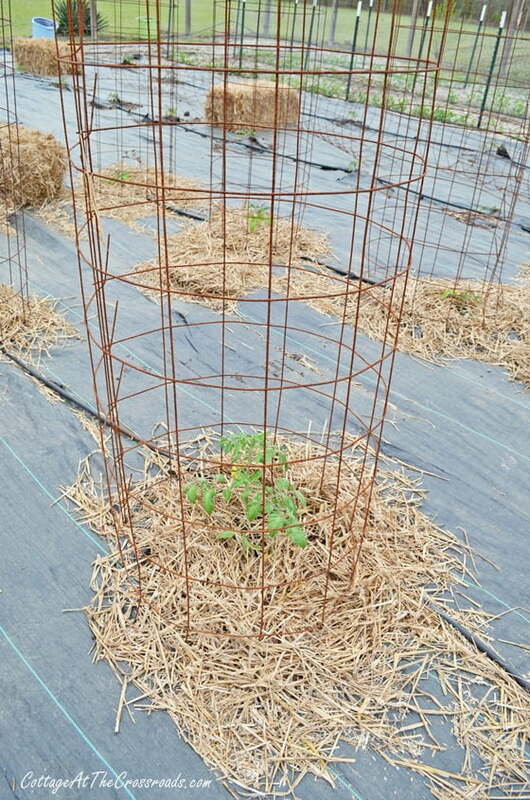 You can read more about this in last year’s post Our Tomato Planting Tips. The fish is not totally necessary, but it provides calcium for the plant to avoid blossom-end rot. Adding bone meal to your hole will do the same thing. As always, when I’m in the garden, Lucy is with me. 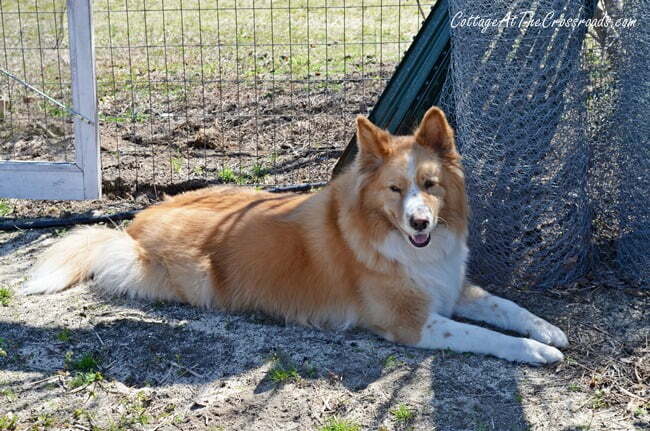 The difference is that’s she’s smart enough to find the shade! Mix all the ingredients in your hole and then you’re ready to plant your tomatoes. Once again, I recommend you buy your tomato plants at a local feed and seed store because they can advise you about the varieties that grow best in your area. I like to spread wheat straw to hide the landscaping fabric and plus it serves as a good mulch to help retain moisture. 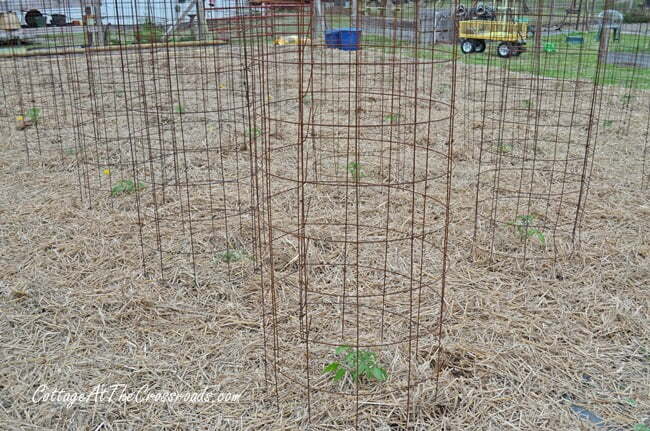 I know the plants are very small, but I go ahead and place my tomato cages around them. You can read how I make them in the post DIY Tomato Cages. Last we plant marigolds in between each plant because they help control nemotodes, attract pollinators, and basically add beauty to the garden. We’ve put 74 plants in the ground so far, and we’ll probably add a few more. Stay tuned for an upcoming post about the different tomato varieties that we choose to plant. They say that everyone should eat vegetables grown locally, and it doesn’t get any more local than right out my back door! Y’all want to stop by for a tomato sandwich this summer? 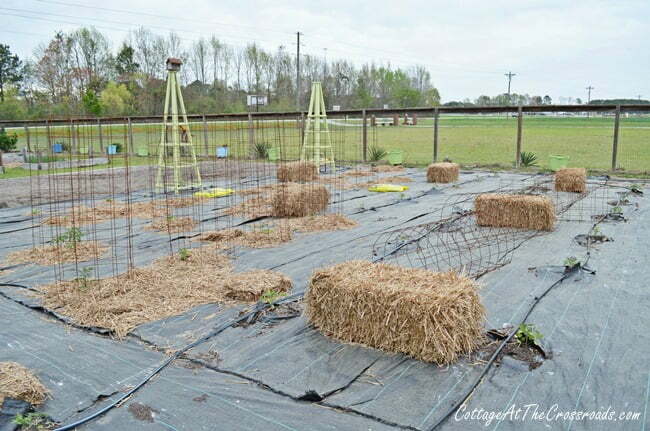 I love that Spring is here and I can see what you two are up to in creating your garden…I so look forward to living vicariously through your terrific garden…unfortunately, my tomatoes come from Harris Teeter!.. 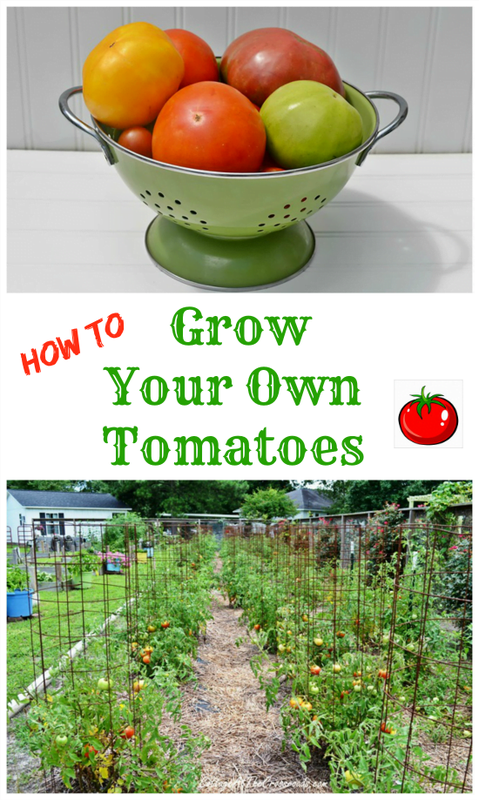 Love your blog and wish I had a spot to grow my own tomatoes! My Daddy used to have a garden where we used to live, and we all looked forward to his wonderful tomatoes!!!! You have brought back a priceless memory for me!!!! OMG 74 plants you can feed the whole neighborhood for sure. I always enjoy seeing your garden it is a piece of artwork. Love all the tips and can’t wait to see it when it all fills in. Will you can all those tomatoes?